Synteko Fast Sealer - a fast drying, one component sealer. Dries in less than 60 min. 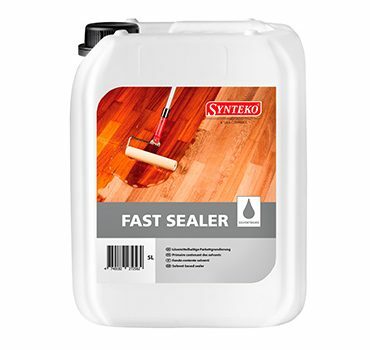 Synteko Fast Sealer is a fast drying one component sealer for use over natural, unstained wood especially oily resinous wood species when applying water based top coats. Dries in less than 60 minutes insulating wood extractives and preserving the natural rich colours, especially of dark woods. Can be screened back and powders well, no ‘gumming’ up, and provides great build. Fast Sealer helps reduce grain raise, edge-bonding and the risk of discolouration in oak and other tannin-containing wood species. Fast Sealer is a low viscosity sealer providing a quick drying for water base application and overlapping marks are generally avoided. Another feature of Fast Sealer is its extended shelf life.